When should I join a business networking group? Networking tips. When should I join a business networking group? Networking tips. EP52. 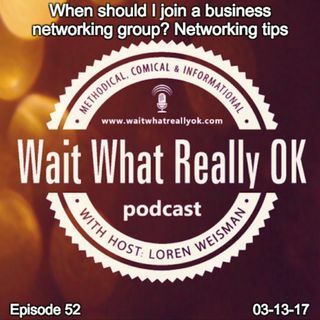 Wait What Really OK Podcast Episode 52 hosted by Brand Precision Marketing Strategist and Counselor, Loren Weisman digs in to joining business networking groups as well as a few observations, ideas and issues that can help over the long term. After joining a few business networking groups, I have noticed a few themes and approaches that can work well and a few others that are poisonous to any success. From how you ... Más informaciones pitch to how you connect, those details as well as the delivery can make all the difference. When you see business networking groups as a tool to help yourself while helping others, you can find that many more connections, opportunities and options. If you are making it all about you, you might not find the benefit at all. When should I join a business networking group. Networking Tips? Ep 52 of the Wait What Really OK Podcast is available on iHeartRadio. Podcast Blog Supplement for Episode 52 of the Wait What Really OK Podcast with Loren Weisman. Podcast Link Supplement for Episode 52 of the Wait What Really OK Podcast with Loren Weisman. Palm Beach Business Connection Coffee Thursday Presentation. Podcast Video Supplement for Episode 52 of the Wait What Really OK Podcast with Loren Weisman. Podcast Photo Supplement for Episode 52 of the Wait What Really OK Podcast with Loren Weisman.